A group, the Human Rights Defenders and Advocacy Centre, HRDAC, has asked the Economic and Financial Crimes Commission (EFCC) to change its name and slogan from 'Nobody is above the law', since its could not probe and prosecute Patience Jonathan the wife of ex-President Goodluck Jonathan. 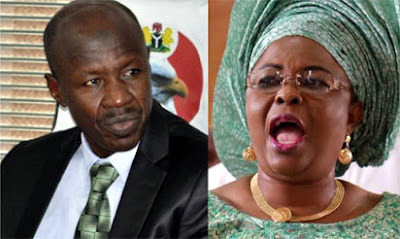 EFCC boss Magu and Patience Jonathan The group in a statement, on Wednesday, title, 'Demand for arrest, prosecution of Patience Jonathan, probe of APC campaign fund and no more sacred cow in the anti-corruption crusade' signed by Queen Ameh, and Innocent Agbo during a protest at the EFCC office in Ikoyi, Lagos said the EFCC was selective in its anti-graft war, as its also questioned why Patience Jonathan was still walking freely in spite of the evidence the EFCC said its has against her. "You have found evidence incriminating Patience Jonathan but we are surprised that Patience Jonathan is still allowed to be walking freely, and even had the audacity to take the EFCC to court to demand the release of her money to her." The group also said the EFCC should change its slogan from 'Nobody is above the law', since it had found it difficult not to only go after Patience, but the likes of ex-Presidents, including Ibrahim Babangida, Abdusalam Abubakar, Olusegun Obasanjo and Goodluck Jonathan. Agbo during the protest lamented that "I have been to this same EFCC to bail several people over the issue of N500,000 passing through their accounts innocently. They were invited, they came voluntarily and you people held them. But we have somebody with our money, $15m which is N6bn, walking freely. On Ibrahim Babangida, Abdusalam Abubakar, Olusegun Obasanjo and Goodluck Jonathan. Agbo said 'we have the issue of Badamasi Babangida; it is open knowledge that N12bn gulf money was missing under his regime, nothing is done; we are aware of Obasanjo and the $16bn power funds, you people are not investigating it; we are aware of the petition against Amaechi to the EFCC; we are aware that the APC did not get the funds for its election campaign from only Buhari's account. We are aware that you are probing the Peoples Democratic Party, why are you not probing the APC?" he questioned The EFCC Deputy Director of Operations, Mr. Iliyasu Kwarbai, speaking with the protesters vowed that if its investigation uncovers evidence of corruption against the wife of former president Goodluck Jonathan, Patience, she would not be left off the hook and that 'Nobody is above the law', "Let me tell you, there is no sacred cow; anybody who is found wanting, who involves himself or herself in corrupt practices will not be spared. I have received your petition, it is here and what do we do? We go into investigation immediately. Now we have seen the name of Patience Jonathan; it is here. If she is found wanting, she will never go scot-free. So also any other person no matter how highly placed he is. "We must sanitise our country and provide a very good environment that people can come and invest in; an economy that is devoid of any economic and financial crime. So, we are happy to see you here; we have received it and we are going to go into action. I am going to inform my chairman that you were here and that we'll commence investigation immediately."